Our favourite kitchen product and utilities brand, Tupperware is back with TupFest. An annual festival, Tupfest is giving you a chance to do a #bigkitchenmakeover and bring premium and stylish products into your kitchen. Grab this opportunity and also stand a chance to save big! From cooking, baking and storage, read on to see the best of the products that you can get under INR 5,000 this season. We all love accessories that make our life easier. And, when it comes to kitchen storage, there are a lot of things to consider. The storage containers need to be transparent, compact and well-sealed to protect food stuff from moisture and external elements. 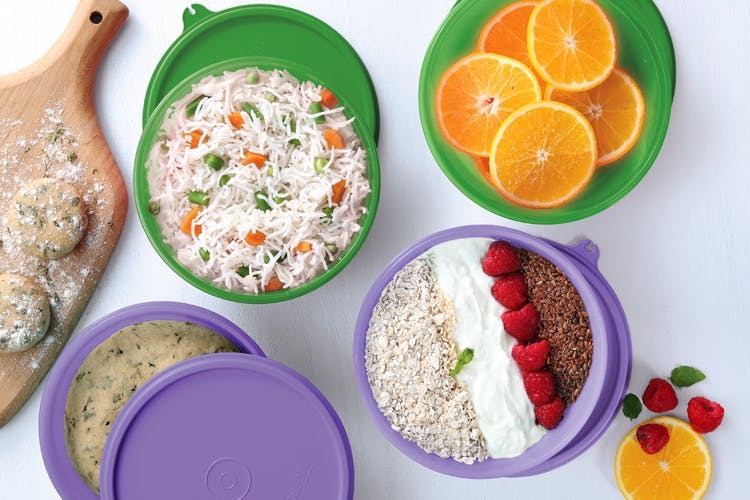 If you think you’ve got stylish containers, we bet you haven’t seen Tupperware’s Smart Saver Mega Set yet. A set of two boxes, they’re available in a range of sizes and styles to give your kitchen just that extra bit of functionality along with the looks. Buy it for INR 2,625. While we’re on the subject of functionality, let us introduce you to the Prep Set – the best way to bring order bring some order to a chaotic kitchen. Keep your kitchen clean and organised with essentials like the Magic Flow Set that can keep cooking oils, vinegar and other in place. The set comes with a ladle, vegetable peeler and master masher. So, it’s ideal for storing and serving a variety of oils and sauces. It has a special spout designed for easy pouring that prevents spillage and wastage too. P.S. Through all this food prep, can get a new product called PrepMate which will surely become a staple prepping gadget in your kitchen. Buy it for INR 2,720. We love the prepping bit but post meal leftovers give us the chills. So, whether it’s storing fruits or vegetables, putting the puree in a container or keeping away chopped ingredients, you’ll fall in love with Tupperware’s refrigerator set. Available in different styles, you can easily spot the dish with the colourful lids, and you don’t need to worry about any messy spills or unwanted smells in your refrigerator. The FridgeSmart range from Tupperware comes with a seal and a guarantee of freshness. This will make your raw vegetables and fruits last much longer than when stored without in the fridge. Buy it for INR 4,290. Now that your refrigerator is set in style, why not bring unique storage for the unrefrigerated items? Honestly, we’re loving this ingenious way of storing onions, garlic and potatoes in the kitchen. It has a hygienic click and lock lid to protect infestation, a great design to maintain humidity and is compact enough for multiple storage. Not to forget this will add the much needed style in your kitchen while also solving a host of common kitchen problems. It comes in two sizes based on storage needs – 3litres and 5.5 litres. This unique product is super effective in minimising rotting and sprouting of onions, potatoes and garlic. #LBBTip: Get different AccessMates for potatoes and onions to keep them fresh. Buy it for INR 2,250. Yay! It’s Time For Lunch! Why should style be limited just to your kitchen? Show off your dynamic personality at work with a cool lunch bag and container set. Since meals are synonymous with happiness, store it in Tupperware’s sleek and cute combination sets which come with a bag to keep all the delicious dishes safe and protected from light and moisture. Whether you’re having salads, soups, fruit or dal and sabzi, it’ll stay fresh through the day. Buy it for INR 1,000. Make your kitchen special with Tupperware and indulge yourself with their gorgeous products that bring ease and functionality in your life, from cooking and baking to storage, and that too under INR 5,000. Check out Tupperware’s TupFest to get amazing discounts on an extensive range of products and utilities – they’ve got everything to get your dream kitchen ready. After all, the kitchen is the place for all the good food… And good memories! Visit Tupperware’s website to browse through their catalogue. Follow them on Facebook, Instagram and Twitter to stay updated about their offers.